The Lord has set my heart free to run in him. I feel like I am running in the “breezes” of the Lord. It was a position in life I was not able to obtain for such a long time. Because of the negative choices I had continually made, it created in me a heart of fear. I always longed to be able to feel that freedom in my God. I longed to be able to experience running, and standing, with confidence in the Lord. I have learned that God is waiting with wide and open arms for all of us to approach him. And what is it that God is waiting for? Intimate fellowship, intimate prayer and communication, intimate dialogue and conversations about anything and everything, and the sharing of our most personal, private, and secret thoughts. I learned that God is looking for seekers! God is looking for those who are not afraid to try to establish a personal, on-fire, passionate, intense, and willing to tell-all and share-all love relationship with him. God is looking for a maximum intense kind of personal relationship with no holds barred. He is looking for on-fire and passionate people who will try to tear into him; people who will try to take hold of Him. He seeks those who will try to understand Him and His ways. A professional athlete will give it his best and give his all every time he goes out to compete in an event. God wants us all to show the same amount of intensity in our personal relationship with Him and in our own personal seeking of Him and all of His ways. Just to emphasize the importance: God want us to be seeking him, take hold of him. He wants us to seek him with maximum effort and maximum intensity. I believe that seeking after the Lord and establishing a good, deep, intimate, personal relationship with Him is all part of a sanctification process. Something that God wants to do with each of us. When I stop to think of the kind of God we are dealing with, the God of the entire universe, I see a best friend that will never harm you, never hurt you, mistreat you, lie to you, leave you, or forsake you. Finding this out to be true in my own life is changing me. I do not need to worry about myself because God will take care of me. I am experiencing that to run with “My heart open wide” is exciting. Running in his instructions for my life, and in his righteousness, is freeing, it is life! I see myself like a picture I saw on my Facebook that shows a little dog running (see photo above). 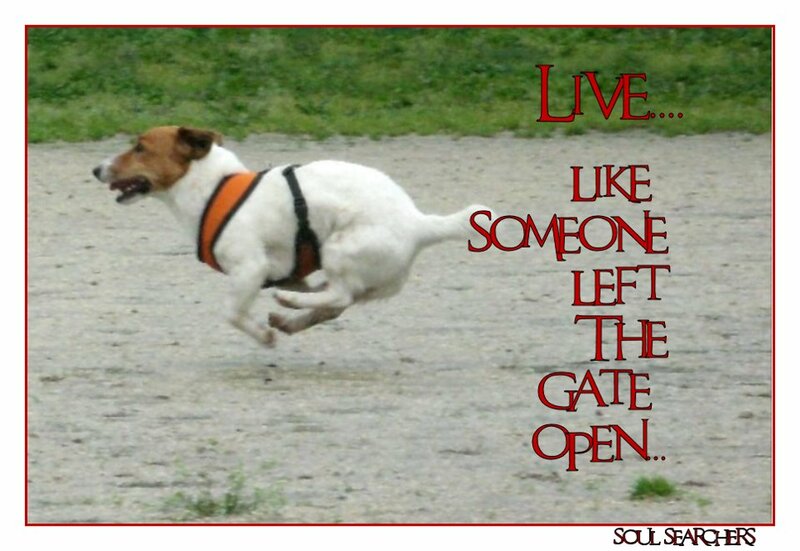 The quote was “run like someone left the door open” and in my life, I am finding that someone left the door open. That someone is God. He left the door of my heart open and I am running straight into his arms. Then, he turns me around and says to me, “Now go run with your heart wide open with my blessing and peace.” Love like you mean it, live like you mean it. Wow….I am blown away every time I am awake, or asleep, because of the God to whom I declare my allegiance!